An Argentine composer born June 21, 1937 in Cordoba. A pianist by training, Beatriz Ferreyra studied harmony and analysis with Nadia Boulanger and then musique concrète and electronic music at the GRM and the RAI, as well as composition with Earl Brown and György Ligeti in Darmstadt. 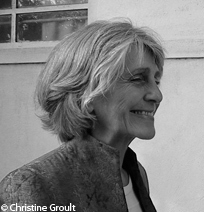 Working at the GRM, she collaborated notably in the Traité des objets musicaux (1966) and the discs of Solfège de l’objet sonore (1967) by Pierre Schaeffer. She has taught at the Paris Conservatory and has been a member of many juries for electro-acoustic music competitions. She is also interested in works designed for music therapy, has undertaken instrumental research with Bernard Baschet and became a member of the Composers’ College of the GMEB. Her works, mainly acousmatic, take root in sensations, perceptions, feelings and in an individual musical vision both colourful and structured that she puts into sound. She also composes for the ballet, shows and the cinema. Her works include Demeures aquatiques (1967), Étude aux sons flegmatiques (1971), Jeu des rondes (1984), Le Petit Poucet magazine (1985), La ba-balle du chien-chien à la mé-mère (2001), Le solfégiste solfégé (2003), L’autre rive (2007), Les larmes de l’inconnu (2011), Senderos de luz y sombras (2017). Beatriz Ferreyra was born in Argentina, in Cordoba, in 1937, into a family of artistic sensibilities, notably with regard to the piano and drawing. Her childhood was thus filled with listening to classical music and concerts. She studied the piano with Celia Bronstein in Buenos Aires while cultivating her penchant for drawing. She subsequently trained in industrial drawing in the United States before leaving for Europe. She settled in France in 1961 and studied harmony and analysis with Nadia Boulanger. She discovered musique concrète and electronic music with Edgardo Canton and then trained with the Groupe de Recherches Musicales (GRM) as well as in Italy with the RAI (1963). She also attended the composition classes of Earl Brown and György Ligeti (Darmstadt, 1967). From 1963 to 1970 she worked at the GRM under Pierre Schaeffer. She collaborated in the research work of Henri Chiarucci and Guy Reibel on the relationship between the pitch and the fundamental of a musical sound. She also took part in the Traité des objets musicaux (1966) and in the realisation of the discs for the Solfège de l’objet sonore (1967) by Pierre Schaeffer. Later she founded the concert series “Les Rendez-vous de la Musique Concrète”. In charge of interdisciplinary seminars for the Service de la Recherche, she played a pedagogical role in the courses of the GRM and also gave lectures at the Paris Conservatory. From 1970 Beatriz Ferreyra devoted herself entirely to composition. She undertook instrumental research with Bernard Baschet into ‘sound structures’, incorporating this into her compositions from 1967. Thus, for Demeures aquatiques, the sound sources are both classical instruments and those, less orthodox, invented by the Baschet brothers and constructed out of sheet metal or pieces of glass. In 1975 she joined the Composers’ College of the Groupe de Musique Expérimentale de Bourges (GMEB) before being invited to the electronic music department of Dartmouth College in the USA (1976), where she undertook computer work. She was also interested in the realisation of works designed for music therapy (1973-1977). Acknowledged by her peers, she has often been a member of juries for international electro-acoustic music competitions, such as the Bourges Competition for Experimental Music in l976, the radiophonic competition Phonurgia Nova in Arles in 1987, and, in 2000, the competition of the Royal Mons Music Conservatory in Belgium and Métamorphoses of the group Musiques & Recherches in Brussels. In 2014, the O.I.M. CIME/IMC UNESCO grant her the title of Honorable Member of the Organisation. She regularly receives commissions from the GRM, the GMEB (International Institute for Experimental Music in Bourges) and the ACIC (Association for Collaboration between Instrumentalists and Composers). Beatriz Ferreyra defines herself as an acousmatic musician and composes mainly electro-acoustic works that have been played in France and abroad. Her compositional technique is based on sensations, perceptions and feelings: she ‘sees’ music in colour, with fixed and moving forms, like tableaux that are at once static and dynamic and thus seeks a son that coincides with her vision. She also composes music for the ballet, shows and the cinema. Her works include Médisances (1968), Étude aux sons flegmatiques (1971), Siesta blanca (1972), A la lueur de la lampe (1973), Échos (1978), Cercles des rondes (1982), Bruissements (1982), Petit Poucet magazine (1985), The UFO forest (1985), L’Autre… ou le chant des marécages (1987, revised in 2004), Remolinos (1990), the cycle Les Rivières du rêve (1993-1999), La ba-balle du chien-chien à la mé-mère (2001), Jazz’t for Miles (2001), Les Chemins du vent des glaces (2002), Le solfégiste solfégé (2003), Dans un point infini (2005), Sourire d’automne (2006), L’autre rive (2007), Un fil invisible (2009), Flotando (2010), Les larmes de l’inconnu (2011), Senderos de luz y sombras (2017).